Welcome to TechRadar’s updated Super Smash Bros. Ultimate review, for Nintendo Switch. Oh, Smash Bros. Nintendo's iconic, chaotic brawler has given us a lot of good memories over the years, and the latest addition to the series looks set to continue its legacy, while looking back on everything – and every fighter – that made it great. Super Smash Bros. Ultimate packs in more fighters, more stages, more gameplay modes, and more tactical elements of any game in the franchise. This is, for all intents and purposes, the definitive Super Smash Bros., with everything that entails. We've sampled all of the Classic, Smash, Spirit, and World of Light game modes Super Smash Bros. Ultimate has to offer – including the crucial online competitive multiplayer, now that the game's global servers have finally stuttered online. But what did we think of the latest iteration of Nintendo's iconic brawler? Read on in our definitive Super Smash Ultimate review below. Update: Super Smash Bros. Ultimate has got a new fighter. Piranha Plant (from the Super Mario series) has landed for those who pre-ordered the title, though you'll have had to claim the DLC by midnight January 31. Nintendo also brought in a host of gameplay tweaks to further balance out fighters' movesets, even publishing the full patch notes. The core experience of any Smash Bros. game is the multiplayer, whether that’s local co-op on the couch, or smashing heads in competitive matches online. Like its predecessors, Super Smash Bros. Ultimate looks to the tactical mechanics of traditional fighting games, and then chucks them into a sandpit of all your favorite toys – throwing together characters from Pokemon, Legend of Zelda, Super Mario, Metroid, Animal Crossing, and countless other Nintendo or third-party IP. The result is a chaotic, joyous, maddening, sometimes incomprehensible mess of blows, items, assist trophies, and finishing moves. In short: it’s very, very fun. As ever, each fighter comes with a variation on standard attacks (A button and directional pad), special attacks (B button and directional pad), grab attacks (L / R), and shields (ZL / ZR). That’s not to mention the seismic ‘smash attack’ that fighters earn from capturing a floating orb called the ‘Smash Ball’ that wanders onto the stage – a massive and over-the-top special move with the potential to brutally damage the other fighters onstage. A smash attack might see a fighter jet fly into the fray (Fox McCloud) a ball of lightning knock players off the stage (Pikachu), or a vampire-slayer banish an opponent into a virtual coffin (Richter Belmont). Smash Bros. has a flair for the dramatic, and Ultimate is no exception. Ultimate remains surprisingly accessible too, with enough luck thrown in that you never quite know how a match is going to turn out. Jumping around and button-mashing remains a valid – and crucially, fun – way to start out, given how dynamic the stages and interfering items tend to be. The chaos is part of the charm, of course, and Ultimate ramps up the overall speed for livelier, faster-paced combat. Other mechanical changes that prevent skidding, stop fighters from ‘phasing’ past each other, and make grabs bounce off each other, make this a game where you can’t as easily run or avoid attacks, and it’s all the stronger for it. The ability to customize matches, though, means you can either ramp up the heat or strip the back the experience for something simpler. You can cull all the items, or only allow banana peels and Pokeballs. You can pick your favorite stage to battle on – out of the immense 103 options available – allocate one at random, or set the game to jump to a different stage at an unspecified point in the match. You can vary the number of lives, turn off damage counters, restrict character selection, and too many other things to list here. There's no shame in sticking to default settings, but if that sort of detail and customization interests you, you may spend as much time experimenting with small settings changes as you do actually brawling. Local co-op can support up to eight individual players around one console, with either a Pro Controller, paired Joy-Con grip, or single Joy-Con. While players with a Nintendo Switch Online subscription can battle in up to four-player matches online, there isn't as much freedom as you'd like. Players can set their 'preferred rules' regarding use of items, number of players, and style of match, but it's just that: a preference. You'll often find yourself playing in configurations you didn't sign up for, just because that's what the game found easier to match you up in. Recent patches seem to be improving this, though. Players are also reporting numerous issues with lag and connection speed – crucial for high-speed competitive play where a few milliseconds could be the difference between dodging an attack or being thrown offscreen. The promise of Smash Bros. competitive multiplayer will have sold a lot of Nintendo Switch Online subscriptions, so we're hoping this continues to be addressed – but be warned that you'll need a strong internet connection, and possibly some patience, to get the online experience you wanted. You’ll then have the ability to unlock other fighters through the single-player modes, or in chance encounters that literally spring out at you when navigating the game’s menus. The main point here is that near enough anyone sitting down the play Super Smash Bros. Ultimate will know one of the characters on the roster. Whether you’re a veteran gamer who grew up playing Ice Climbers and Pac-Man, a long-time Metroid or Super Mario fan, or someone who bought a Nintendo Switch just to play Splatoon 2, you’ll recognize some of the faces, and likely have played some of the IP featured here. While the mechanics are complex, and painstakingly tweaked to ensure balance between the huge number of characters – we couldn’t even guess how many hours of playtesting Nintendo needed – anyone can pick up a Joy-Con and start swinging their fists as Kirby or Donkey Kong. By going big with its character list, Nintendo have opened up the franchise far beyond any of the previous games. You’ll see this with the 11 brand new fighters added for Ultimate. While the likes of Ridley and King K. Rule both offer small variations on ‘heavy’ fighters, and Daisy and Dark Samus copy the moveset of existing characters, others bring something far more experimental. The Inklings from Splatoon have an ink meter that needs to be recharged every few moves – literally by submerging yourself in paint – though this will leave you vulnerable to melee attacks. The Pokemon Incineroar too offers big offense, but has a tendency to launch itself offstage if you’re not careful about where you’re facing. Everyone except pink little Kirby, that is, who’s presumably too cute to be doomed with the others. You set off as Kirby on a quest to fight the possessed bodies of your friends, who have been inhabited by ‘spirits’, in order to add other fighters to your roster and choose your route across the World of Light map as you make your way to the final boss, Galeem: some sort of feathery-light-serpent-god that's to blame for messing with everyone's souls. These spirits offer the main departure from previous Smash Bros. games. Spirits are essentially a form of collectable sticker you can allocate to fighters to increase their stats, alter their weight and speed, or add special effects and items in battle. Spirits replace the collectable trophies players would collect by battling and defeating characters in previous games, with a far more tactical element. The spirits also take the form of hundreds of other Nintendo and third-party characters that are likely to inspire joyous nostalgia and puzzled looks in equal measure. That’s not to mention the Classic Mode, with a unique series of stages and opponents for each fighter. Or dedicated challenge modes and All-Star Smash stages (where you fight every single fighter on the roster). Or the camera mode for replaying battles and picking the perfect angle for your heat-of-battle stills. Or the new training mode that lets you test out the exact distance, power, and angle of each of your fighter’s moves on a literal giant graph. But whether you’re here to hone your skills, take some fun snaps, or just smash that controller to high heaven, Ultimate has something for you, and enough fighters to offer near endless replay value – even if you're only ever likely to stick with a handful that suit your play-style. The whole spirit conceit is slightly nonsensical – but for the gamers who recognise Mega Man’s Skull Man boss, Advance Wars’ pilot Hawk, or the Slime from Dragon Quest, finding and collating those stickers is a treat unto itself, and will offer a whole other layer of tactical complexity to those who are looking for it. Super Smash Bros. Ultimate is all about giving players what they want. Say what you want about Smash Bros. on the home console Wii U or lower-spec handheld 3DS – few people bought into the hardware to play on the former, while it was never going to feel like a complete experience on the latter. The line-up of games for the Nintendo Switch has had no shortage of Wii U ports, like Mario Kart 8 Deluxe, Pokken Tournement DX, or Donkey Kong Tropical Freeze – and we could well have got a port of the Super Smash Bros. entry that came to Nintendo 3DS and Wii U. But Nintendo went further. We got a brand new Smash Bros. game, built from the ground up for Nintendo Switch. We got every character ever featured in the series, along with a host of new faces, and a fully fleshed-out single-player mode. That’s 74 fighters total, with another five coming in DLC (Piranha Plant and Persona 5's Joker are both confirmed, and our money's on Detective Pikachu making an appearance). For comparison, Street Fighter V has a roster of 34 characters, while the latest Tekken game lists 48. We may never get to play as Waluigi (sadly relegated to an Assist Trophy) but there’s more than enough here to distract ourselves. You may not use half the settings, or end up trying 80% of the roster, or bother about collecting every 'spirit' character throughout the game. And if there's anything to criticize in Super Smash Bros. Ultimate, it's that there's almost too many fighters, modes, and convoluted options packed in. As exciting and inclusive as the roster is, 74 or 79 fighters are a lot for players to keep track of, and the increasingly serious focus of Nintendo on competitive play / eSports – with the complexity and intensity that entails – may well mean drifting away from the casual nature of much of its intended fanbase. Even if the initial troubles with smooth online play aren't going to please either camp. Super Smash Bros. 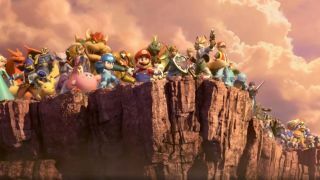 Ultimate may try to do both – and do them well – and this 'definitive' Smash Bros. may feel to some like its soul is split down the middle. Whatever you're playing for though, Ultimate is a lot of good fun.